The British Dental Health Foundation recently distributed some interesting UK survey results on oral cancer. Reading their media release, I wondered: Would US survey results be similar? 88% of the public would like to be checked for oral cancer at their dental appointments. 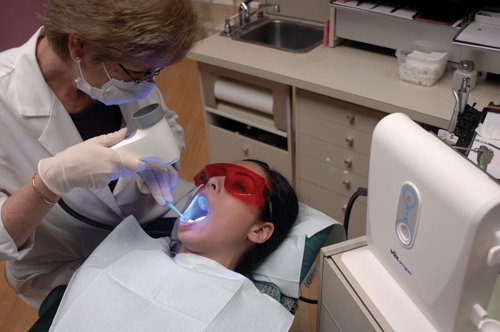 89% of dentists check for signs of oral cancer. 68% use tools like VELscope to check for cancer. 84% of dentists do not explain the risks and symptoms of mouth cancer to their patients. Almost half – 43% – do not provide oral cancer educational material to patients. How do you effectively “promote awareness” then? Clearly, oral cancer is something we need to be talking about, dentists and patients alike. So it’s no surprise that the BDHF’s media release about this survey focused so sharply on the need for better communication. “Mouth cancer cases are increasing at a phenomenal rate due to choices in lifestyle such as smoking and alcohol. The disease, its symptoms and risk factors need to be discussed honestly and openly more often and there’s no better place to start than at a dental check-up. If you’re not sure your dentist checks for cancer at your regular appointments, just ask. Ask your dentist to explain the procedures and what he or she looking for. Talk with him or her about any risk factors you may have and preventive steps you can take. im not in pain..why do i have to go through this? There may be no pain now, but treatment now is your best bet against it or other problems cropping up down the road. Left untreated, most dental problems only become worse and require more extensive (and expensive) treatment to fix. So I encourage you to talk with your dentist about both your concerns and your options – and wish you all the best.